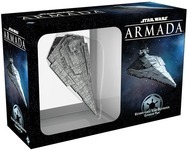 The Victory-class Star Destroyer Expansion Pack bolsters your fleet with one sculpted and pre-painted miniature Star Destroyer identical to the Star Destroyer miniature from the Core Set. It also comes with all requisite tokens and command dials, as well as more than a dozen ship and upgrade cards. your armament, your crew, and even your Star Destroyers themselves.